Surveys have been recently completed for post Curly Leaf Pondweed (CLP) treatment as well as pre Eurasian Water Milfoil (EWM) treatment areas. LSIA is pleased to report successful results for the May treatment for CLP. Permitting is in process and we plan to treat for EWM by the end of June prior to the 4th of July Holiday. Please see the above map outlining the proposed treatment areas. Our Lake is looking great, LSIA board thanks you for your continued support. The DNR has issued an Invasive Aquatic Plant Management permit to Lake Sarah Improvement Assn in Hennepin County to treat targeted CLP (permit in .pdf). Treatment using AquatholK (Endothol) was applied by Craig Mueller of Aquatic Solutions on Monday May 21,2018. 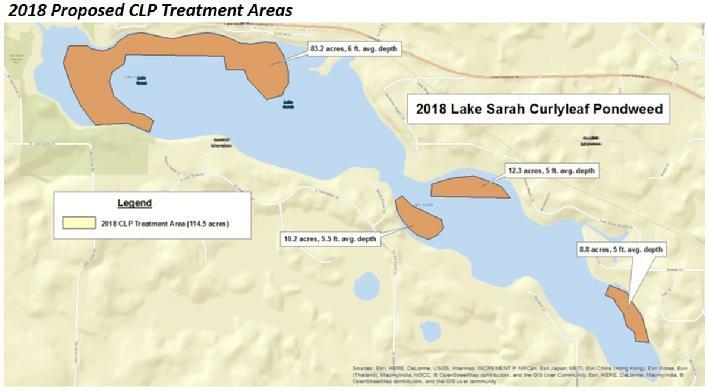 This Lake Vegetation Management Plan (LVMP) authorizes a 5-year variance from time of signing to treat greater than 15% of the littoral area of Lake Sarah (DOW# 27019100) to control curly-leaf pondweed using herbicides. Individual (near-shore) APM permits for submerged plants will be subject to a 2,500 square foot maximum standard and a 15 foot channel to open water. Justification for this variance include the potential for this project to further research on the control of invasive aquatic plants in conjunction with an alum treatment. Annual monitoring and submission of data to the MnDNR is required in this LVMP. In Spring 2017 LSIA once again is planning a full lake CLP treatment and monitoring program for our lake and will coordinate with Aquatic Solutions for the optimum time to maximize the treatment effectiveness. To fund this years program LSIA is asking for a donation of $150 per Lake Sarah household. Checks may be mailed to the LSIA at P.O. Box 25, Loretto MN 55357 or use PayPal link below. Please remember all donations to LSIA are tax deductible! Make your contribution to the CLP Treatment Program here! Stakeholders and lakeshore property owners have been asked to help offset the cost of the CLP Treatment program with a tax deductible contribution of $150. To make your contribution using PayPal just click on the button to the right. Or if you prefer, checks payable to the Lake Sarah Improvement Association may be mailed to LSIA, P.O. Box 25, Loretto, MN 55357. The 2017 treatment map (above) shows the roughly 260 acres proposed for treatment using Aquathol K 9permit pending) to be applied by Aquatic Solutions. If water temps continue to progress this treatment could occur sometime in late April. This will be the 5th year of LSIA CLP treatment program. This year marks a change to the use of a professional contractor for our whole lake treatment. On Friday May 6, 2016 Lake Restoration treated the selected areas. Although it was a fairly windy day, LR staff was confident that the introduction of the aquacide below the surface would still be effective. Also, with the past years grant funds being unavailable, residents have been asked to contribute $250 towards the treatments. If you haven't donated to water quality yet, you may do so HERE. Thank you for your support throughout this entire process. LSIA recently applied for a permit and it was approved to treat Eurasian water milfoil (EWM) on the lake. Currently, EWM is growing actively along shorelines and shallow areas. You can see a great example of this along North Shore Drive where the EWM formed a patch that is matting along the surface. Several homeowners also have this along their shoreline. The DNR restricts the area we can treat to 15% of our littoral acres which is roughly 50 acres to treat. Last week our third party consultant inspected the lake and identified the areas of greatest need. These 50 acres should cover almost everyone. Please see attached map for the areas we'll treat. The DNR also requires us to notify all residents of the upcoming treatment which will take place early next week. If you do NOT want to be apart of this treatment we need to know by Sunday, June 21st at 7pm. 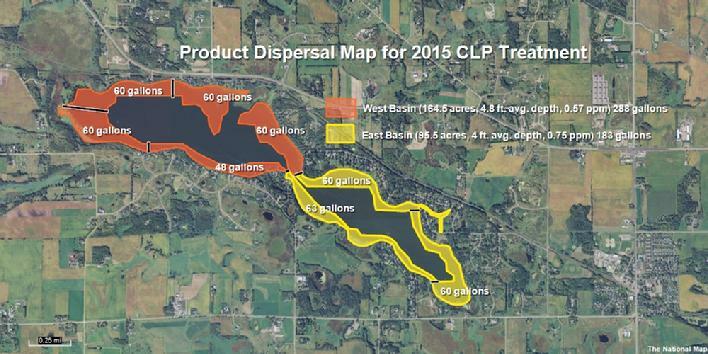 The LSIA will complete another "whole lake" Curly Leaf Pondweed (CLP) treatment in 2015! 1. Self-treat using responsible LSIA volunteers. By self-treating – we control the timing of the early season, low dose treatment which helps ensure the most ideal conditions and the effectiveness (plus we save 50% of the cost vs hiring a professional treatment company). Presuming approval of our application we will again use Aquatic Solutions for a very competitively priced product, the free use of their application equipment, and the volunteer services of Craig Mueller to coach us during the treatment process. We will also partner with Eric Fieldseth as a qualified consultant to help us determine the # of acres to treat, the appropriate application rate, and amount of product needed in order to achieve the desired results. Three Rivers Park District (TRPD) and the Pioneer Sarah Creek Watershed who assist in funding and the TRPD provides vegetation surveys to validate our effectiveness. The MN Dept. of Natural Resources who fully support our volunteer program and we expect will have grant funds available again in 2014. "Block Captains" – which help to raise awareness, help collect needed signatures, post application notice signs, and helps promote LSIA membership / donations. 3. Offer optional treatments for Eurasian Water Milfoil (EWM) – up to DNR set limits. We ask that residents DO NOT make any commitments to weed treatment providers at this time. Some providers have already mailed sign-up forms for 2015. Please understand that working together as an association on a "whole lake" approach is a more cost effective approach – and is the only long term solution to controlling CLP, our worst invasive. If you’d like to discuss this further, feel free to call Wade Bemmels at 612.790.8896 . The Water Quality Committee will again host informational meetings to be scheduled in early April that will allow lakeshore owners the opportunity to attend and ask any further questions they may have. On behalf of the LSIA, we thank you for supporting our efforts toward improving Lake Sarah! LSIA was granted an opportunity to treat a limited amount of Eurasion Water Milfoil (EWM), in addition to the earlier treatment for Curlyleaf pondweed. This limited EWM treatment was permitted by the DNR for up to 15 acres. LSIA was also fortunate to receive a DNR grant of $2,000 to help purchase the product, and with some product we have on hand yet from our 2012 pilot EWM treatment, the full cost of this treatment will be covered by the LSIA. The treatment was applied on 8/12 and 8/13 and was again applied by LSIA volunteers. The post treatment inspection report dated 9/16/14 can be viewed here. Click here to view a map of areas treated. The areas selected were recommended to us by our independent consultant as the areas where the highest concentration of EWM is occurring – and yet also where most everyone should benefit from a noticeably better boating and recreational experience. 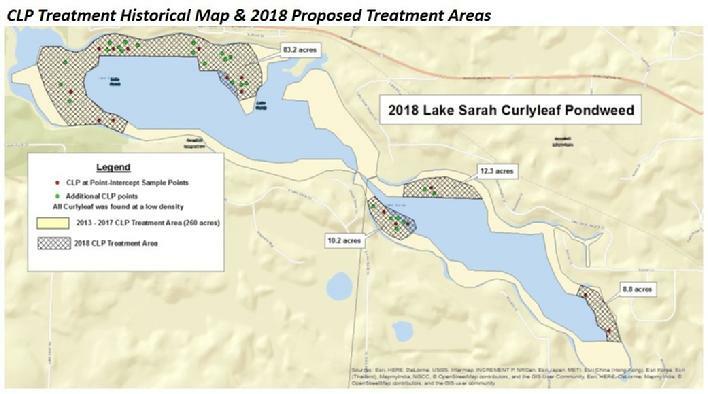 Even if this treatment is not directly inline with your lakeshore it will reduce the spreading of EWM and incrementally improve the overall quality of Lake Sarah. You will notice that a fair amount of the EWM is located near to the shoreline, where treatment occurs within 150 feet of the shoreline, LSIA will place a treatment notice / sign along the shore. Residents should understand that EWM is not the only weed that is currently matting the surface, as we have a lot of native Coontail as well. This treatment should be effective on EWM, however, at the dosage rate we’ll be using, is not intended to kill the Coontail. As the EWM plants are quite mature, it could take up to 3 weeks to see the full effects of treatment. If there are further questions – or concerns, feel free to call Joe Baker at 612.868.8702. Lake Sarah’s experienced volunteers treated 260 acres as planned on Saturday, May 17, 2014. With two pontoons, volunteers completed the 260 acre whole lake treatment in just under 5 hours. the photo shows of one of the pontoons. Scott Walsh (with the respirator) managed the application dosage, with John Wise running the GPS to guide Craig Smeby driving the pontoon. Craig Mueller again provided us free use of his application equipment, and he donated his time to manage the other pontoon application, along with the assistance of Mike Peterson and Al Moen. Roger VanBeusekom and Todd Zaugg manned the product trailer and kept the dock operating smoothly with the exchange of barrels. All of these volunteers participated last year, so all went very smooth. Thanks to all for your time and efforts! With the last of our snow melting, warm weather in the forecast, we could see the ice disappear within the next week. As soon as ice out occurs, we'll inspect for Curly Leaf Pondweed, to make sure we have it over the same 260 acres as last year (which we should). We will target treatment as soon as the lake water temps reach 50 degrees, and we have a calm day to ensure the wind does not cause product to "drift". At this time, based on "normal" weather, it appears treatment for CLP could occur either the last week of April, or the first week of May. 1. We have our approved DNR permit in hand for up to 260 acres of CLP treatment. 2. We have confirmed that we will again receive a DNR grant for $100 per acre, or $26,000 in total for this treatment (same as last year). 3. Additionally, we will receive approx $10,000 again this year in cost sharing from the Three River's Park District and the Watershed. So if we can again successfully collect a $100 donation for each lake lot owned on the lake, we will again fully cover our treatment costs. The LSIA will complete another "whole lake" Curly Leaf Pondweed (CLP) treatment in 2014! 1. Self-treat using responsible LSIA volunteers. By self-treating – we control the timing of the early season, low dose treatment which helps ensure the most ideal conditions and the effectiveness (plus we save 50% of the cost vs hiring a professional treatment company). o Aquatic Solutions for a very competitively priced product, the free use of their application equipment, and the volunteer services of Craig Mueller to again coach us during the treatment process. o Eric Fieldseth as a qualified consultant to help us determine the # of acres to treat, the appropriate application rate, and amount of product needed in order to achieve the desired results. o Three Rivers Park District (TRPD) and the Pioneer Sarah Creek Watershed who assist in funding and the TRPD provides vegetation surveys to validate our effectiveness. o The MN Dept. of Natural Resources who fully support our volunteer program and we expect will have grant funds available again in 2014.
o "Block Captains" – which help to raise awareness, help collect needed signatures, post application notice signs, and helps promote LSIA membership / donations. 3. Offer optional treatments for Eurasian Water Milfoil (EWM)– up to DNR set limits. We ask that residents DO NOT make any commitments to weed treatment providers at this time. Some providers have already mailed sign-up forms for 2014. Please understand that working together as an association on a "whole lake" approach is a more cost effective approach – and is the only long term solution to controlling CLP, our worst invasive. If you’d like to discuss this further, feel free to call Joe Baker at 612.868.8702. Whole lake CLP Treatment was completed on Wednesday May 15! The LSIA is pleased to confirm that on Wednesday, May 15th, 2013, our first "whole lake" Curly Leaf Pondweed (CLP) treatment was completed! Mother Nature was quite kind to us as she delivered us nearly perfect weather. With very mild winds and a sunny and warming temp forecast, this causes the CLP to be actively growing during the critical "contact" period - providing us an ideal treatment scenario. The Aquathol K product was safely* applied at an "early season, low dose" rate of just .75 parts per million (ppm) - evenly over 260 acres in just under 7 hours time! After considering the dispersing "drift" nature of this product, it is believed we should attain an effective treatment over all of the 320 acres identified in the pre-treatment inspection completed by the Three Rivers Park District staff. Inspections over the next 2 to 3 weeks by Eric Fieldseth will ultimately confirm the overall effectiveness of our treatment. * Both the MN Dept of Natural Resources (Steve Hanson), as well as Stephanie Ende of the MN Dept of Agriculture supervised the start of the process. They attended to ensure all plans for treatment were well thought out and in place, that we had the needed knowledge and expertise, the proper application equipment, and that all those directly involved in the handling of product were wearing the required and approved personal protective equipment correctly. Their attendance was appreciated - and we were pleased to have passed their inspection just fine! Kraig Smeby and Al Moen - for volunteering and captaining their pontoons. Volunteers Scott Walsh, Mike Peterson, Todd Zaugg, and John Wise. Rich Braschof The Three Rivers Park District. Jerry Wise – our representative on the Pioneer Sarah Creekwatershed Commission. Keegan Lund, Chip Welling, and Wendy Crowell of the MN DNR. On behalf of the Water Quality Committee, and the LSIA Board, we just want to say a big thanks to everyone for your trusting and supporting our collective efforts of improving Lake Sarah! May 15, 2013 - whole lake treatments begin. Block Captains putting up signs, winds are light., water temps should be in the low 50's. MN DNR Permit # 13W-3A037. 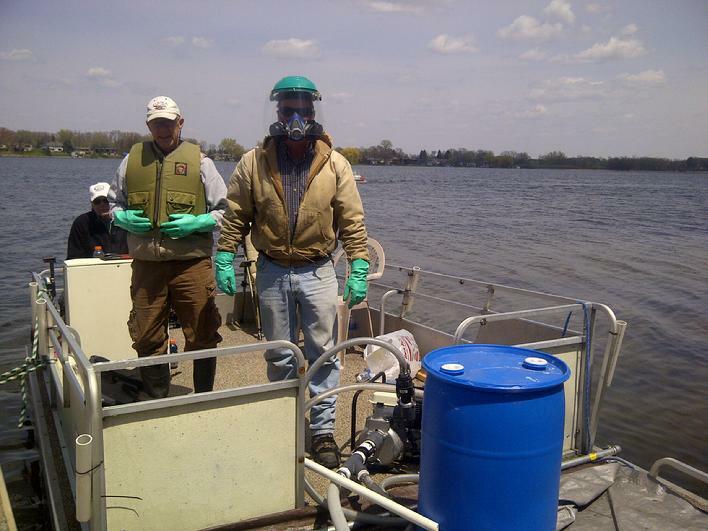 2013 Whole lake treatment plan update (May 14, 2013) - Progress to date! We are making good progress in preparation for our first “whole lake” early season, low dose treatment of Curly Leaf Pondweed (CLP). 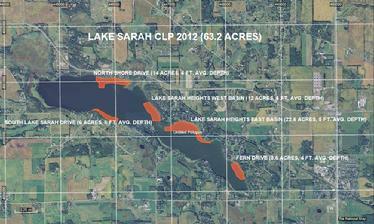 CLP inspections by the Three Rivers Park District (TRPD) on Lake Sarah occurred last Wednesday thru Friday. The DNR participated for a portion of the day on Thursday. The vegetation survey showed that there was some level of CLP growth over about 320 acres of the lake – about 228 in the west basin and about 92 acres in the east basin. 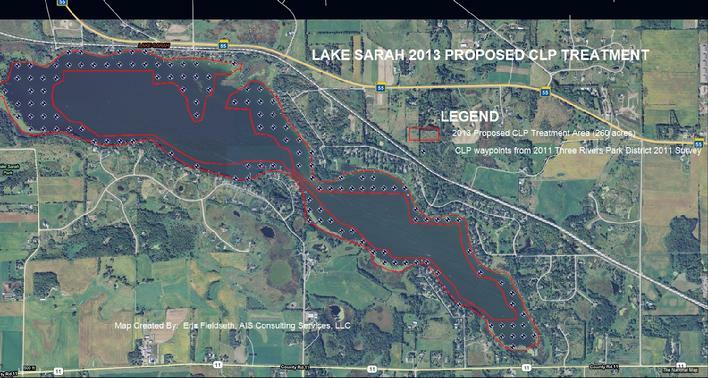 While it is true that the CLP in Lake Sarah (and most lakes this year) is down in terms of biomass from previous years, we still believe the correct way to proceed is to move ahead with the “whole lake” treatment approach of 260 acres. While the CLP densities are down – and the CLP growth is somewhat stunted from previous years, there is a clear opportunity to get excellent control through better CLP plant contact with the herbicide due to the lower biomass. Thus, basis discussions today with the DNR, we are pleased to advise they will be issuing us the whole lake CLP only permit tomorrow for up to the 260 acres we asked for… and that this treatment amount should knock out all the CLP in the lake! Based on the current water temp, and the next 10 day weather forecast – and availability of treatment volunteers, we determined it is best to treat this Wednesday afternoon (May 15th) – up until dark (as winds die down), and what we can’t finish Wednesday eve, we’ll finish Thursday morning (when winds look to be minimal). 2013 Whole lake treatment plan update (April 28, 2013) - Progress to date! We are making good progress in preparation for our first “whole lake” early season, low dose treatment of Curly Leaf Pondweed (CLP). At this time, we estimate treating 260 acres, however, actual acres to be treated will be subject to a plant survey to be completed by the Three Rivers Park District (TRPD) soon after ice-out. LSIA volunteers will again perform the treatment. By self treating, we save as much as 50% of the cost vs hiring a professional treatment company. We can also choose the treatment timing to when the water temp and weather conditions are ideal to ensure optimal effectiveness. Aquatic Solutions will provide our Aquathol K product at a very competitive price, their application equipment at no cost, and Craig Mueller will again volunteer to coach us during the treatment process. Tom Larson & Al Moen will again volunteer their pontoons for the application process. Thank you! Eric Fieldseth will help us determine the amount of product needed to achieve the desired results. He will also complete a post-treatment inspection and the required reporting back to the DNR. The total cost for the CLP treatment is likely going to be between $45-50k. Our DNR grant award for the CLP treatment is $26k. We also expect to receive approximately $10k from a recently approved 5 year cost share agreement between the TRPD and the Pioneer Sarah Creek Watershed Management Commission. Thank you to Richard Brasch and Jerry Wise for your leadership efforts on this cost share program. The balance of our costs we hope to cover from donations made from lakeshore owners. The block captains are making good progress to date – to help educate and administer the process of collecting signatures of consent and LSIA donations to support this first whole lake CLP treatment. We also plan to provide Eurasion Water Milfoil (EWM) treatments for those blocks who wish to optionally treat for EWM in addition to CLP. Please note we will be limited to just 50 acres of EWM treatment – and the cost for the EWM treatments will be paid by those blocks that choose to treat. WE NEED TO KNOW BY MAY 10 AS TO WHICH BLOCKS ARE INTERESTED IN EWM TREATMENTS SO WE CAN DETERMINE TREATMENT ACRES (BY BLOCK) AND APPLY FOR THE NEEDED DNR PERMIT. On behalf of the LSIA, we thank you for supporting our efforts toward improving Lake Sarah! If anyone has immediate questions or concerns, they can contact Joe Baker email Joe. Thank you to Joe Baker and the LSIA Water quality committee for their efforts on behalf of this weed treatment program. 2013 Whole lake treatment plan update (March 12, 2013) - Progress to date! We will self treat using responsible LSIA volunteers - to save over 50% of the cost of otherwise hiring a professional treatment company – and by self treating – we can better control the timing of the treatment to ensure we have the most ideal conditions to ensure the effectiveness. We will continue to partner with Aquatic Solutions for our Aquathol K product needs, the eir application equipment, and the volunteer services of Craig Mueller to again coach us during the treatment process. We will continue to partner with Eric Fieldseth as a very qualified consultant on an as needed basis to help us determine the number of acres to treat, the appropriate application rate, and amount of product needed in order to achieve the desired results, and to complete post-treatment inspections and required reporting back to the DNR. He will also attend our public information meetings to answer any questions members may have. We will continue to partner with Richard Brasch of the Three Rivers Park District (TRPD) and the Pioneer Sarah Creek Watershed Management Commission (PSCWMC) to ensure they are aware and supportive of our approach – and of which they may assist in funding our efforts. We have applied for the DNR grant funds available to support the early season, low dose treatments of CLP, and expect to learn if we are awarded grant funds in the next 30 days. We will continue to use the block captain concept – and we have added additional block captains to help further distribute the administrative process of collecting signatures and LSIA donations. The next steps: The volunteer block captains will meet in early April to learn the details of our plans and their role. The Water Quality Committee will host two public informational meetings to be scheduled in April that will allow lakeshore owners the opportunity to attend and ask any further questions they may have. We plan to collect signatures of consent as well as contributions to support this year’s treatment program. We again want to remind lakeshore owners to please not seek or commit to professional treatment service providers at this time. If anyone has immediate questions or concerns, they can contact Joe Baker email Joe. Thank you to Joe Baker and the LSIA Water quality committee for their efforts on behalf of this weed treatment program. The initial goals of the 2012 treatments were to prove the effectiveness and establish methods for the LSIA to treat their own aquatic invasive weeds on a volunteer basis. This experience would help dictate a comfort level on the part of the LSIA to increase to a whole-lake treatment in 2013 for Curlyleaf Pondweed. 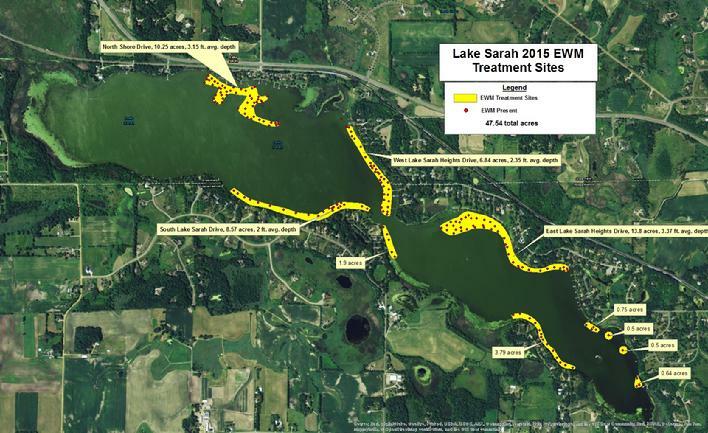 Through several meetings with the LSIA board and homeowners of Lake Sarah, treatment locations were determined along with the willingness from homeowners to treat for Eurasian Watermilfoil in select areas as well. The DNR ultimately approved 50 acres for the treatment of Curlyleaf Pondweed and 50 acres for the treatment of Eurasian Watermilfoil. Due to a very early spring, aquatic plants were at least a month ahead of where they typically were. This created a heavy workload for the DNR in issuing permits, and thus the LSIA was forced to wait for their permit to be approved a little later than desired. Water temps increased into the 50’s quickly, but luckily ended up holding steady long enough to make the appropriate treatments for Curlyleaf Pondweed. By the time treatments were made for Curlyleaf, a vast majority of the plant was topped out and matting. Mature plants can take longer to die, however the heavy density of Curlyleaf created good conditions to get the desired contact time needed for the herbicide to be most effective. The LSIA was also able to obtain a grant from the MN DNR to help pay for the treatment costs. March 30, 2012 - Pre-Treatment Survey. A pre-treatment inspection was performed to delineate the initial proposal of 70 acres of Curlyleaf Pondweed. During the inspection, the area was further delineated to approximately 63 acres that actually had Curlyleaf. Curlyleaf was noted to be abundant in nearly every treatment site on the lake, with some sites close to being topped out. Sparse Eurasian Watermilfoil was found during this time, leading to the conclusion that the LSIA should wait to treat the EWM. April 18, 2012 - Received permit from the DNR. The permit allowed for 50 acres of Curlyleaf Pondweed and Eurasian Watermilfoil control. The permit was restricted to offshore areas only (150 ft. from shore and out). April 22, 2012 - Pre-Treatment Survey. Given the wait time to receive the permit from the DNR, another survey was needed to assess the current state of Curlyleaf Pondweed and Eurasian Watermilfoil. Curlyleaf was abundant everywhere and topped out in several areas. Eurasian Watermilfiol was starting to become a problem, but through discussion it was decided the LSIA should wait to treat the EWM at a later time when more EWM was actively growing, and just to focus on the Curlyleaf Treatment at this time. April 29, 2012 - Curlyleaf Pondweed Treatment (50 acres). This first treatment was for 50 acres of Curlyleaf Pondweed. Aquathol K (Endothall) was the herbicide used at a rate of 1 ppm. The wind speeds were about 5 – 10 mph out of the Southeast, making ideal conditions for the treatment. The treatment took less than one day with a lot of help from Lake Sarah volunteers under the guidance of Craig Mueller from Aquatic Solutions, who is a licensed applicator with many years of experience. May 8, 2012 - Permit was amended. The permit was amended to include onshore areas (within 150 ft. of shore) and also gave us a wider range of rate for 2,4-D, which was needed for the EWM treatment. May 16, 2012 - Post Treatment Survey. North Shore Drive: CLP treatment looks good, still some spotty CLP in areas, but it is starting to die and decompose so I expect it to be gone within the week. Everywhere else is CLP free, except for the channel area going out towards the main lake. The area that seemed to get some control was narrower than the actual channel treatment area; some of the CLP in this area is still green and healthy, while some is dying. I expect it to thin out some within the week. Lots of CLP outside the treatment area showing some injury, with probably 500 feet west of the treatment site getting complete control out probably 200 feet or so. Still lots of algae, lots of EWM, Coontail and some Elodea. South Lake Sarah Drive: This area seems to have gotten better in the last day or two according to Scott. There are still scattered spots of CLP, but a lot of it is starting to die and decompose. There are a few areas that are still a little green. Within the week it should look even better. The areas that still have some green CLP are right onshore, which we were not allowed to treat during the 2012 CLP treatment, so that would explain why some is still healthy. There are also a few areas in deeper water that still have some green CLP. Overall, I think more CLP is dying in this area. They also have plenty of milfoil. Lake Sarah Heights Drive West Basin: This area looks great overall, with only a few scattered spots of CLP remaining, which is in the process of dying. There is a lot of injury to CLP outside this treatment area as well, complete control north of the treatment site quite a ways. Also, lots of EWM here. Lake Sarah Heights Drive East Basin: Overall, great success here with once again a few scattered patches of CLP still in the process of dying. On the far eastern edge of the treatment site where it gets narrow and goes around the corner (by Roger's house) there are still some patches of CLP that are green and some that are dying. I expect it to thin out some within the week, but some may remain. This area has a sharp drop off making control difficult due to contact time. EWM throughout this area as well, with lots of Coontail. Fern Drive: CLP is pretty much gone on the north end, but as you head south in this area there still seems to be plenty of CLP below the surface, it seems to be fairly healthy with some dying. I think this area had more injury to the plants, but not enough to knock them out. I expect it to thin out some within the week, but some will still remain. Lots of Coontail on the north end, with a few scattered plants of EWM. Not much EWM in any other part of the site, I would honestly not recommend treating this site for EWM, there is not enough there. Overall, (Eric) recommend treating the entire North Shore Drive area for EWM, along with the entire Lake Sarah Heights Drive East Basin for EWM. Fern Drive does not have enough EWM to warrant a treatment. CLP is mostly gone, with some still dying. Few scattered patches of green CLP, especially in Fern Drive, but overall I call it very successful for a pilot program, especially since we treated when the plants were nearly topped out and more mature. Also, lots of control outside the treatment areas, meaning there was probably more drift than expected. May 18, 2012 - Permit was amended. The permit was amended to allow for up to 5 acres to re-treat Curlyleaf Pondweed. This permit ended up not being needed, as almost all the Curlyleaf ended up dying off. 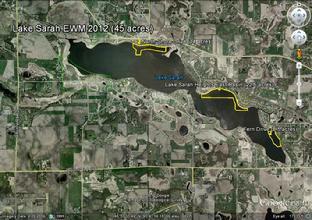 May 20, 2012 - Eurasian Watermilfoil Treatment (16.2 acres). During this treatment, it was noted that almost all of the Curlyleaf Pondweed in the lake was gone, even areas outside the treatment areas. Three sites were originally proposed for EWM treatment: North Shore Drive, Lake Sarah Heights Drive East Basin and Fern Drive. However, due to a lack of EWM in Fern Drive, treatment only occurred in North Shore Drive and Lake Sarah Heights Drive East Basin. 16.2 acres were treated during this time. The winds were calm, around 5 mph, and were coming out of the Northwest. The EWM was treated with DMA-4 (liquid 2,4-D) at a rate of 2 ppm. June 5, 2012 - Permit was amended. The permit was amended to allow EWM treatment for two additional sites, South Lake Sarah Drive and Lake Sarah Heights Drive West Basin. There is a total of 10 acres between these two additional sites. June 6, 2012 - Eurasian Watermilfoil Treatment (10 acres). The two additional sites, South Lake Sarah Drive and Lake Sarah Heights Drive West Basin, were both treated on this day for a total of 10 acres. The wind was from the Southeast at 5 – 10 mph. June 29, 2012 - EWM Post Treatment Inspection. The EWM treatments worked great in the four treatment sites, with very little EWM remaining. The EWM that is still remaining is dying and decomposing. There are a couple spots with flowering milfoil, but they are mixed in with very thick stands of Coontail and covered with filamentous algae. Coontail is definitely the most abundant plant right now in the lake, covering many areas of the shoreline creating thick mats on the surface. Filamentous algae is also a problem right now, covering almost all the aquatic plants in the lake. Several natives were also noted, including Elodea, Wild Celery, Sago Pondweed and Coontail. The following are pictures taken from this survey. click this link to view the 2012 Lake Sarah Vegetation Management Summary which includes the 2011 Aquatic Plant Surveys and discussion, Aquatic Plant Management goals, 2012 Herbicide Treatment summary, timeline and maps. Plus recommendations for 2013. Weed treatment update - 6/3/12: The LSIA volunteer treated pilot program so far has been a great success! LSIA received DNR approval to self treat up to 50 acres of Curly Leaf Pondweed (CLP) and 50 acres of Eurasion Water Milfoil (EWM). (click here to view permit) The CLP was treated on April 29th, and while some of the CLP took additional time to drop, we saw all 5 pilot areas (and even beyond) completely CLP free within 3 weeks of treatment. The concept of self-treating under the optimal water temperatures and weather conditions has clearly proven to be cost effective - especially with the $7,500 secured via a DNR grant. click here to view grant app. On May 20th, 2 of the 5 treatment areas were treated for EWM, and while it takes up to 4 weeks to see the full effects of treatment, we are pleased with the results seen thus far. A permit amendment has been requested to treat 12 additional areas for EWM (South Lake Sarah Dr, and the west bay along Lake Sarah Heights Drive) which was granted on 6/5/12 (click here to view permit). To the residents involved in this pilot program, we thank you for your support! Full results of this pilot program will be summarized in the LSIA summer newsletter. CLP Treatment applied (4/28/12) - For the 64 residents who participated in the pilot treatment program, 50 acres of our Curly Leaf Pondweed (CLP) was treated this morning. With the required DNR permit in hand, the AIS grant contract fully executed, and with optimal water temperature and calm winds, your LSIA volunteers began administering our first treatment in operation "CLP Assault". Craig Mueller of Aquatic Solutions provided his application equipment and certified guidance free of charge. Tom Larson provided his 24 foot pontoon, with Scott Walsh, Craig Smeby, and Joe Baker working the "waterfront" from Tom's pontoon. The "shorefront" was headed up by Roger VanBeusekom, John Wise, and Lee Nguyen as they posted a bright orange DNR treatment notification sign on each shoreline that received treatment. All 5 pilot areas were treated with Aquathol K product at a rate of 1ppm. Above are 2 photo's of the operation. There was A LOT of CLP - some of which was already matting on the surface, however, as we are well before the formation of turions, there will be no seeds generated in our treatment areas. The treatment will take 7-10 days to take full effect. We'd ask you to remove your signs when the restriction expire on May 12th, and as they can't be reused, they can be tossed. In approximately 2 weeks we will complete a post-treatment inspection and will report back on our findings. This will also be our "pre-inspection" for Eurasion Water Milfoil (EWM)... and so we will report how much EWM we see and can better determine at that time how many acres we will want to treat. As part of the grant administration, the LSIA must pay for the application (product) cost, and we will work with each "block captain" to sort out the financial split within each block treated. The grant money will be shared equally over all of the CLP acres treated today, so if your block does not plan to treat EWM, you can settle this up anytime. However, if you plan to potentially treat for EWM, then we suggest you wait and settle up once the EWM is treated. A recap of each pilot area will be provided to each block captain after treatments are complete. Today's treatment is just one small step in our journey toward making noticeable improvement to Lake Sarah. If you have questions, contact Joe Baker (email). Thank you to all who participated in this pilot treatment program, the block captains for their organizational support and leadership, - and especially the volunteers who made it happen today. 2012 Aquatic vegetation Treatment Program (update 4/12/12) LSIA President Joe Baker reports progress regarding the pilot weed treatment program. Following the pre-inspection it has been determined that only 63.2 acres will need to be treated for CLP vs the originally estimated 70 acres (maps above have been updated to reflect the update). A DNR representative will be visiting the lake in the next few days, hopefully resulting in issuaqnce of the neccessary permit. Water temps are currently in the 54-56F range so we still have some time so long as we don't warm up quickly over the next week to 10 days. Once the DNR permit is approved, we appear to have a very good chance of receiving grant funding of up to $150/acre. More information will be posted when available, plan to attend the 4/26/12 LSIA Spring Membership meeting for a full update! LSIA launches aquatic vegetation pilot treatment program (update 3/5/12) - 5 areas of the lake encompassing 70 litoral acres have expressed interest and have supplied the needed signatures from the affected lakeshore property owners. The permit application was filed with the MN DNR on 3/7/12. If approved the program would potentially treat a total of 70 acres, 45 acres for both curly-leaf pondweed and eurasian watermilfoil and 25 acres for curly leaf only (see maps above). Both inshore and offshore areas are proposed to be treated in the early season test using volunteer applicators. Shoreline property owners along the treated areas will bear the cost of the chemicals used in this test program. 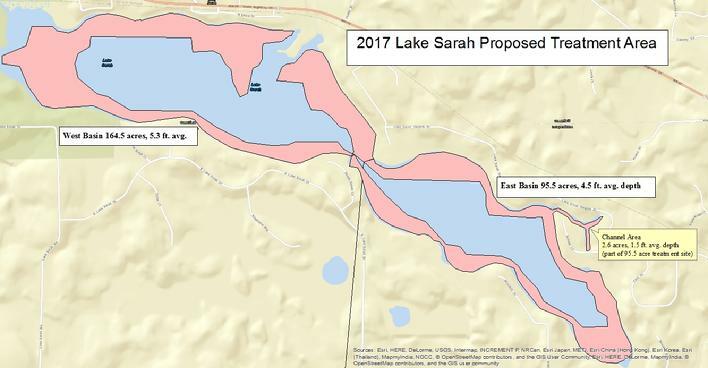 In early February the Lake Sarah Improvement Association received DNR verbal approval to move forward with a "pilot treatment" program this spring that will allow trained volunteers from our lake association to treat up to 40 acres for Curly Leaf Pondweed (CLP) and (optionally) as well for Eurasian Water Milfoil (EWM). Three organizational / educational meetings were held in late February. A series of informational meetings were held and volunteers acting as the block captains organized neighbors and acquired the signatures needed to treat the selected test plots. Please email Joe Baker if you have questions about the program. More information on this topic was emailed to most lake Sarah residents on 2/17/12 and several educational/sign-up meetings will be set up in the coming week to allow for further discussion of the coordinated volunteer application approach. LSIA had a certified applicator / consultant on hand at each of the meetings to answer questions. 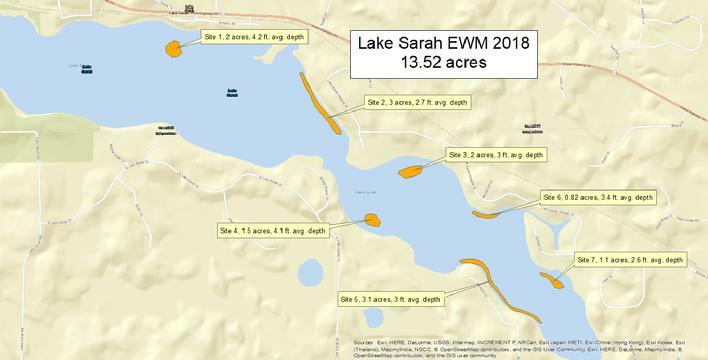 WHY the LSIA is doing this (some background): CLP and EWM are non-native aquatic invasive weeds that have overtaken much of Lake Sarah's littoral zone (i.e. the area of our lake where weeds can grow). Both species are fast growing nuisance weeds, which cause surface matting that inhibits boating and recreational activities. CLP is particularly bad for the lake's water quality as it starts growing very early during winter and dies in June/July, releasing large amounts of phosphorus which cause bad algae blooms. Minimally LSIA wants to greatly reduce CLP in order to improve our lake's water quality, and a reduction of EWM may also be needed in order to restore our native plants. The most recent draft of the Lake (Sarah) Vegetation Management Plan (LVMP) can be downloaded here for those who would like to read further. The LSIA will be finalizing the LVMP with the DNR during this calendar year so they can gain approval for whole lake treatments - starting in 2013. In the meantime, LSIA wants to move forward with a limited "pilot treatment" program this spring so that we can prove out their treatment process, ensure the safety of their approach, and by doing this with trained LSIA volunteers - they can ensure that they treat at exactly the right time - and under optimal weather conditions (i.e. a sunny day with minimal wind) so that the treatment is most effective. Another key benefit of treating with LSIA volunteers is they can manage the cost of application to potentially less than half of what a professional treatment company would charge - and this is key to making future whole lake treatments affordable. WHO LSIA is working with: LSIA is in the process of contracting with Aquatic Solutions, a relatively new and locally owned company, for both our chemicals and consulting. Craig Mueller is the owner of the company and has 13 years of experience having previously worked for Lake Restoration as their Operations Manager. Craig is a licensed applicator, has the application equipment which he will allow the LSIA to use for free this year, and he will train, coach, and supervise LSIA's volunteers. Eric Fieldseth will also be assisting us as a consultant, he has worked most recently as a Seasonal Water Resources Technician for Three Rivers Park District and is very familiar with Lake Sarah and the issues that it faces, having been a part of aquatic plant surveys on our lake as well as water sampling on the lake. Eric also has four years of experience working for an aquatic plant treatment company and has his degree in Aquatic Biology. Both Craig and Eric will be at the educational meetings to answer any and all of your questions. Our LSIA volunteer applicator team will consist of Scott Walsh, Al Moen, and Roger VanBeusekom. LSIA thanks you in advance for your volunteer commitment toward this effort! WHAT the LSIA plans to do as part of their pilot project: The goal is to target the selection of approximately four pilot areas (of approx 10 acres each) where a contiguous group of lakeshore residents are all in support of treating - and are willing to share in covering just the cost of the chemicals - which for those who have paid for professional treatment in the past - an average property owner could expect to see double the treatment area - for roughly half the cost of a professional treatment. LSIA plans to treat from the shoreline all the way out to the edge of the weedline. WHERE LSIA plans to treat on the lake: This has yet to be determined, however, the pilot treatment areas need to be determined by the end of February so that the permitting process can be completed in the first week of March. The critera for being a selected pilot area is simple... we want to select areas that first have a high concentration of CLP - and perhaps some EWM. A second criteria is that a group of contiguous homeowners come together and all agree to sign the permit in support of the treatment area - and also agree to share in covering the cost of the treatment (just the cost of the chemicals). We would like to ask for a "block captain" to volunteer to coordinate each of the pilot areas, making sure to reach out to your neighbors - to help raise awareness and support. LSIA will take pilot areas that meet the above criteria on a first come, first served basis - until the estimated acreage of all submitted pilot areas reaches 40 acres. HOW MUCH might this cost per homeowner? It depends on the size of the area treated, and the average depth of the water treated. See the treatment proposal that will give estimated costs, based on a range of depths and application rates. LSIA wants this first pilot project to be funded by those who will most directly benefit, and you can roughly figure that you will get at least twice the coverage - for about half of the cost of hiring a professional. Once a "block group" is identified, we can discuss these specifics at one of the upcoming meetings. Each pilot area should decide whether they want to only treat for CLP, or whether they want to treat for both CLP and EWM. It was decided LSIA funds would not be used to fund the pilot treatments, but rather will be used towards subsidizing our whole lake treatments starting next year. PLEASE EMAIL Joe Baker ASAP- if you have interest and indicate which meeting date you can attend. We'd encourage that "block groups" try to attend the same meeting. As you reply, please feel free to ask immediate questions you have... and we'll assemble a recap of "frequently asked questions". If you have potential interest in becoming a "block captain", feel free to call me with questions: (612) 868-8702. Please understand that not all residents are LSIA members, so this email is not getting to all your neighbors. Please feel free to share it with others. You do not have to be an LSIA paid member in order to participate.However, if you haven't renewed your membership, now is the time to do so! The LSIA renewal form can be printed from this link. DNR Offers Grants to Control Invasive Aquatic Plants - February 27, 2012 - The Department of Natural Resources (DNR) Invasive Species Program offers Aquatic Invasive Species Control Grants. These grants are intended to help fund the control of curly-leaf pondweed (CLP), Eurasian watermilfoil (EWM) or flowering rush (FR). This offer is an opportunity for local entities, such as lake associations, watershed districts, cities, and counties to receive state funding and/or partner with the DNR on the control of these invasive aquatic plant species. These grant funds can be used for projects that control Eurasian watermilfoil, curly-leaf pondweed or flowering rush using either herbicides or mechanical control, or a combination of both. They are intended to support projects that have received an Invasive Aquatic Plant Management Permit. Grantees must pay project expenses up front and make all arrangements. The first grant application deadline is March 7, 2012. Map of May 2008 weed treatment areas to control curlyleaf pondweed and eurasian watermilfoil. courtesy of Tom Snook, Lake Restoration, Inc. The 2008 early season aquatic weed treatment to control curlyleaf pondweed and eurasian watermilfoil began on Wednesday May 14 and was completed on Thursday May 15, 2008 under the best possible wind conditions available according to Tom Snook of Lake Restoration. The treatment plan for 2008 is privately funded by subscribing shoreline property owners and includes approximately 35 participants and will cover roughly 31-32 acres of lake Sarah's littoral area. Above is a map with the treatment areas marked in red. Click here to view the map in .pdf format. For additional information regarding the treatment program please contact Tom Snook at 763.428.9777 ext 106. Information on the TMDL, Lake Sarah Stakeholders Committee, and ongoing water quality efforts can be found on the TMDL Project page and the TMDL Maps & Charts page in the Water Quality area of this website. 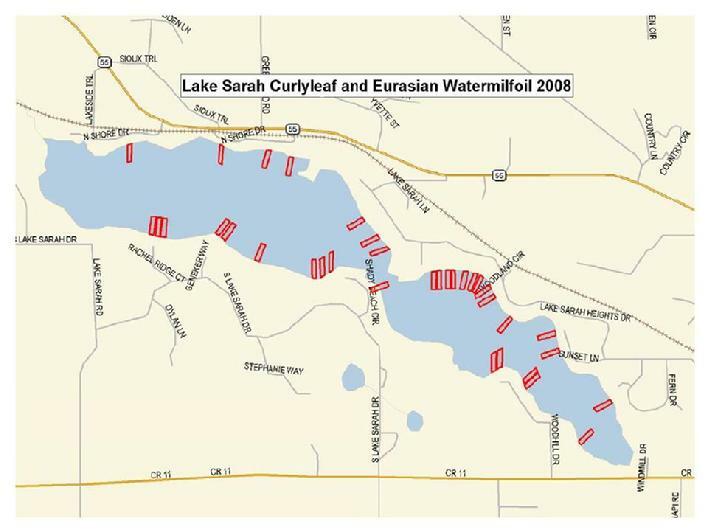 Map showing May 2007 test of combination curley leaf and eurasian milfoil control areas. click on map to enlarge. So you noticed a few areas on Sarah marked by red/white buoys in early May 2007 and you were wondering what they were there for? A weed control test of a 4 selected offshore areas (beyond 150' from shoreline) is being conducted to test an early season combined application of endothol (Aquathol K) and 2-4D to control both Curley Leaf Pondweed and Eurasian Water Milfoil. 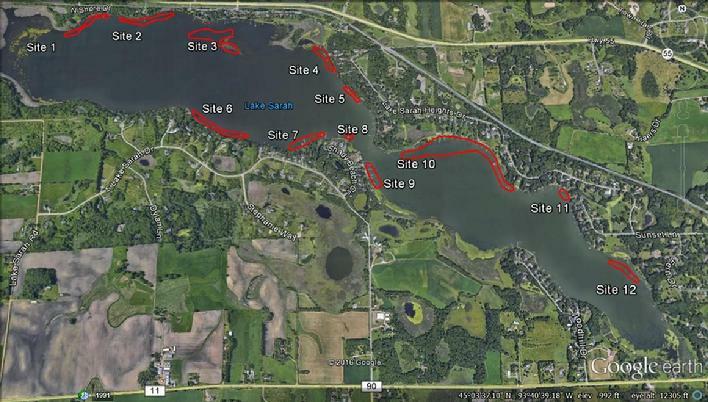 The test areas inside the buoy markers were treated on May 8, 2007 (click on image above to view larger map) by Lake Restoration of Rogers, MN under separate permit from the MN DNR (view permit). Last year the offshore curley leaf treatments along the Cady/Tubesing shorelines resulted in a boom in EWM that was difficult to deal with as offshore permits allow only one treatment per year. If we are going to treat large portions of the lake to reduce curley leaf pondweed in the upcoming years, it would be helpful to have a solution for the EWM that may grow in after the curley leaf is gone. This years test of the combined chemical treatment will attempt to control both invasives in a single application and allow native aquatics to reassert themselves. It should be noted that the cost of the test treatments is being absorbed by the property owners directly adjacent to the treatment areas.